Political engagement can take on many different forms, including voting, contributing money to a candidate or political group, working or volunteering for a campaign, attending a campaign event or contacting an elected official. But on every measure of engagement, political participation is strongly related to ideology and partisan antipathy; those who hold consistently liberal or conservative views, and who hold strongly negative views of the other political party, are far more likely to participate in the political process than the rest of the nation. This results in a consistent “U-shaped” pattern, with higher levels of engagement on the right and left of the ideological spectrum, and lower levels in the center. But the shape of the curve varies across different types of participation. For example, when it comes to voting, the peak is much higher on the right than on the left: 78% of those who are consistently conservative say they always vote, compared with 58% of consistent liberals. 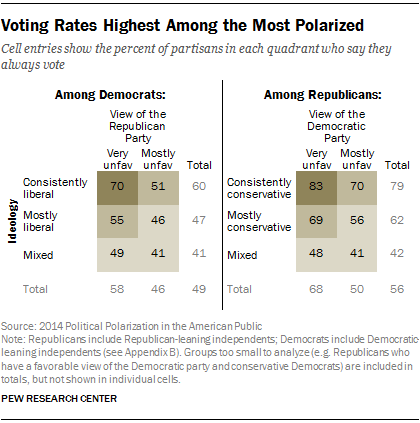 But on both sides, the propensity to vote falls among those whose ideological views are more mixed. 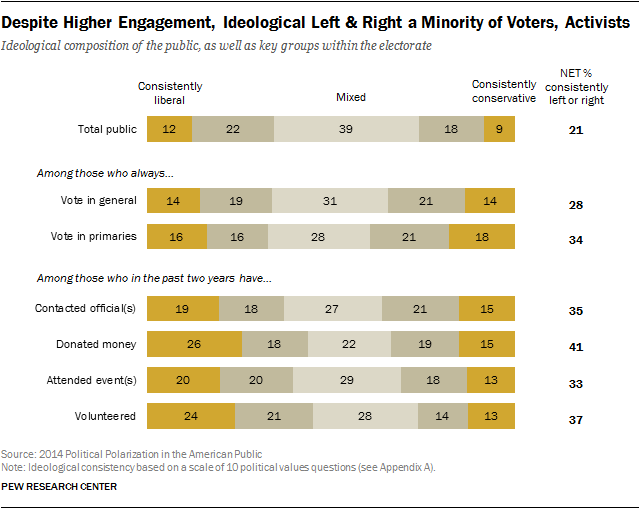 At the center, just 39% of those who hold a mix of liberal and conservative values describe themselves as regular voters. That is half the rate of consistent conservatives. When it comes to who makes political donations, these disparities are even more pronounced. Nationwide, 15% of adults report having made a donation to a candidate running for public office or to a group working to elect a candidate in the last two years. But donation rates are roughly double the national average among ideologically consistent liberals (31% have donated money) and conservatives (26%). 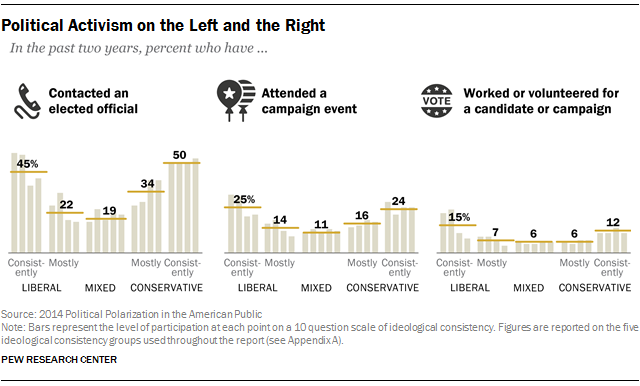 Just 8% of those with mixed ideological views have donated to a candidate or campaign in the past two years. The fact that the peak donation rate is slightly higher on the left than on the right might be surprising, but this includes more small donations from liberals than conservatives. Just 4% of Americans say their contributions in the past two years have added up to $250 or more, including a roughly equal number of consistent liberals (7%) and consistent conservatives (8%). Regardless of the amount, there is an ideological skew in campaign donations: Put together, people on the ideological right and left are considerably more likely than those who are ideologically mixed to have made a campaign donation in the past two years (29% vs. 8%) or to have donated $250 or more (7% vs. 2%). This pattern is also evident across other types of political engagement, including contacting an elected official, attending a campaign event, and working or volunteering for a candidate or campaign. In each instance, people at the ideological left and right are more than twice as likely to be active participants in the political process compared with those who hold a roughly equal mix of liberal and conservative values. To be sure, there are many factors that correlate strongly with voting, engagement and political activism: Age, education and income are among the most prominent. Yet even after controlling for these and other demographic factors known to be associated with higher levels of participation, the relationship between ideological consistency and engagement persists. The current political landscape is marked not just by increased ideological uniformity, but also by growing political animosity, as partisans see the other side in starkly negative terms. 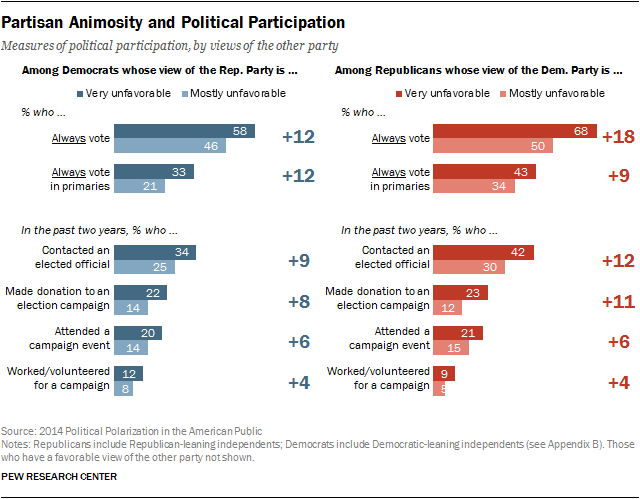 Today, nearly all Democrats and Republicans – including those who only lean toward one or the other political party – view the other party unfavorably, with a steep increase in the share with very unfavorable views. Holding a strongly negative view of one’s political adversaries is also a substantial factor driving political engagement. Among both Republicans and Democrats, those who see the other side in very unfavorable terms are significantly more likely to be regular voters, to make campaign donations, and to participate in the political process in other ways. For example, among Republicans, 68% of those who have a very negative view of the Democratic Party say they always vote, compared with only half of those with a mostly negative opinion. Republicans who strongly dislike the Democratic Party are much more likely to have made a political donation in the past two years (23% vs. 12%), to have contacted an elected official (42% vs. 30%), or to have volunteered or worked for a campaign (9% vs. 5%). The same pattern holds among Democrats, though to a slightly lesser extent; 58% of Democrats who have a very unfavorable view of the Republican Party say they always vote, compared with 46% of those who have a mostly unfavorable view. And Democrats who strongly dislike the Republican Party are more likely to have made a political donation in the past two years (22% vs. 14%) to have attended a campaign event (20% vs. 14%) and to have volunteered or worked for a campaign (12% vs. 8%). All of these patterns hold when it comes to participating in party primaries as well. About four-in-ten (43%) Republicans who have a very unfavorable view of the Democratic Party say they always vote in primaries, compared with 27% of those with less negative views. The same is true on the Democratic side; those with deeply negative views are 12 points more likely to say they always participate in the primaries (33% vs. 21%). 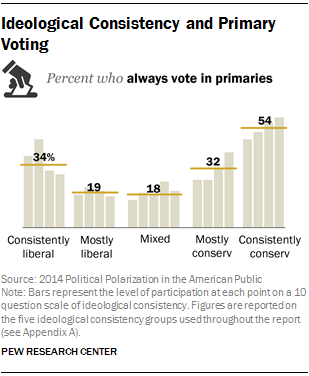 Similarly, most consistent conservatives (54%) say they always vote in primaries, higher than the 34% of consistent liberals who say the same. But both of these groups are far more likely to vote than are people with a roughly even mix of liberal and conservative views, just 18% of whom say they always vote in primaries. To be sure, those who are ideologically consistent – on both ends of the spectrum – tend to have a deeper dislike of the opposing party than those who are less ideological. But even after controlling for ideology, antipathy toward the other party remains a strong predictor of participation in political activities. And those who are both ideologically consistent and have a very negative view of the other party are even more likely to be engaged. Fully 83% of Republicans in this category say they always vote, compared with 70% of consistently conservative Republicans who say they have a mostly unfavorable view of the Democratic Party. Democrats who are consistently liberal and have a very negative opinion of the Republican Party are 19 percentage points more likely to say they always vote than consistently liberal Democrats who have a less negative view of the GOP. Because political participation and activism are so much higher among the more ideologically polarized elements of the population, these voices are over-represented in the political process. Even so, they do not make up the majority of voters, donors or campaign activists. Nationwide, 21% are either consistently liberal or consistently conservative in their political values. But these people make up a larger share of the electorate – 28% of people who say they always vote and 34% of those who always vote in primaries. This pattern is even stronger at higher levels of activism. Consistent liberals and conservatives make up 41% of the people who have made a campaign donation over the past two years – double their presence in the public at large. 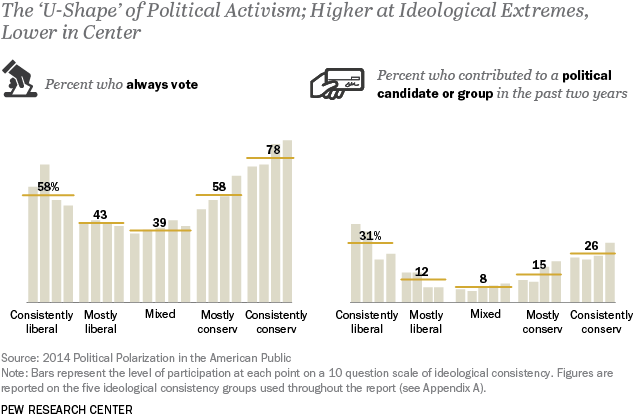 Yet even here, those with ideological viewpoints are not the only participants in the process, as most campaign donors express mixed views or only mostly liberal or conservative views. In short, while the left and the right may speak louder in the political process, they do not necessarily drown out other elements of the public entirely. And this may be one reason why, even in lower-turnout primaries, the more ideological candidates do not always carry the day.